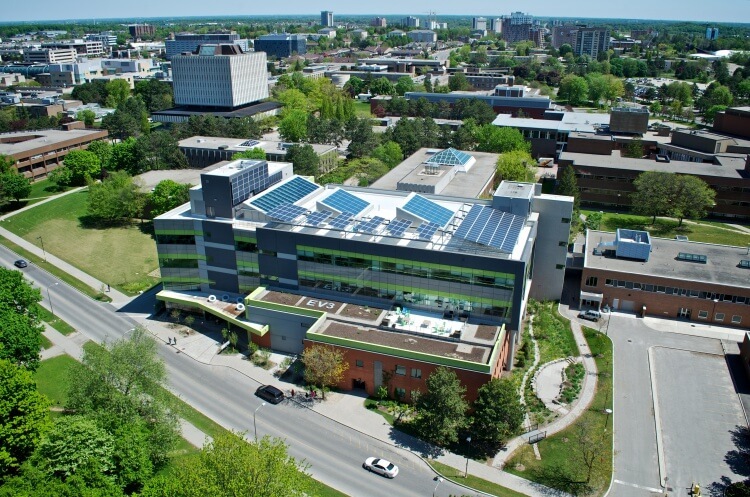 The Faculty of Environment is housed in three buildings on the University of Waterloo campus: Environment 1 (EV1), Environment 2 (EV2), and Environment 3 (EV3). 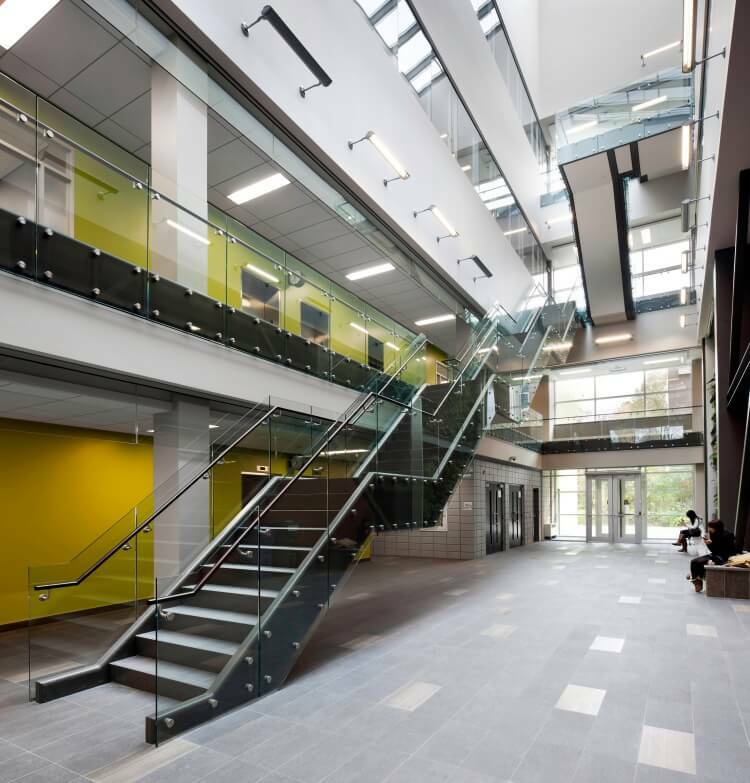 We are particularly proud of our newest addition, the first LEED® (Leadership in Energy and Environmental Design) Platinum certified building on an Ontario campus. 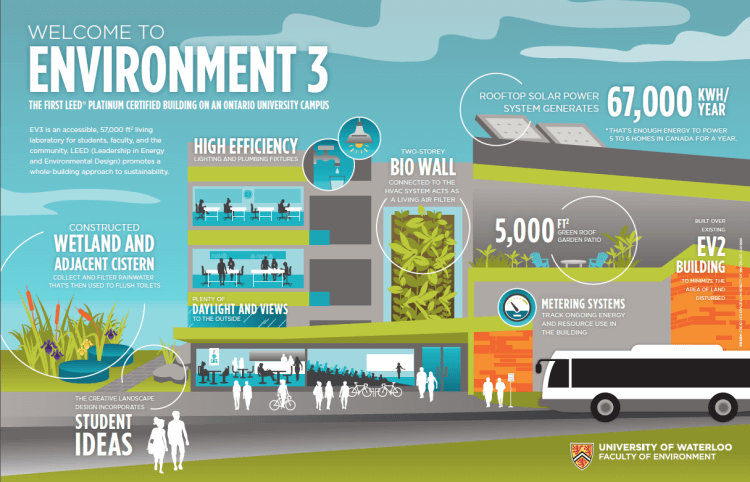 EV3 is home to the School of Environment, Enterprise and Development (SEED) and the School of Planning. It is an accessible, 57,000 ft2 living laboratory for students, faculty, public/private sector partners, and the community. LEED® promotes a whole-building approach to sustainability. From solar panels, to low-emitting furniture, to a two-storey living wall, click the thumbnails below to learn more about EV3's many innovative environmental features. A welcoming atrium with feature staircase spanning all four floors serving as a popular reception area for up to 300 people. 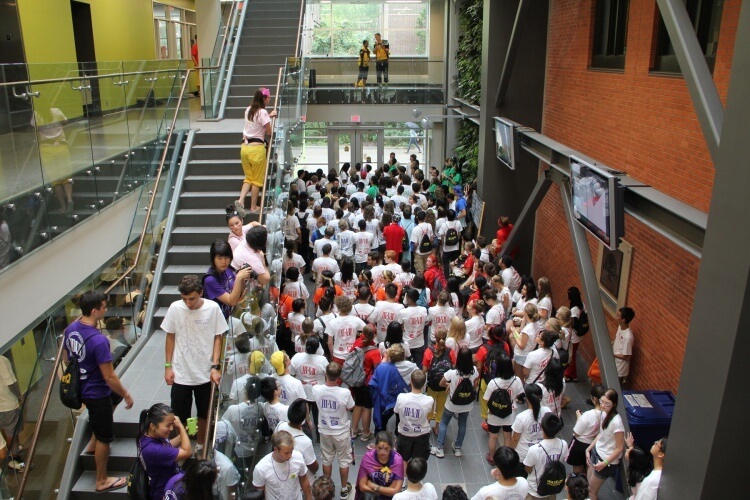 The Minto Atrium hosting a student reception. 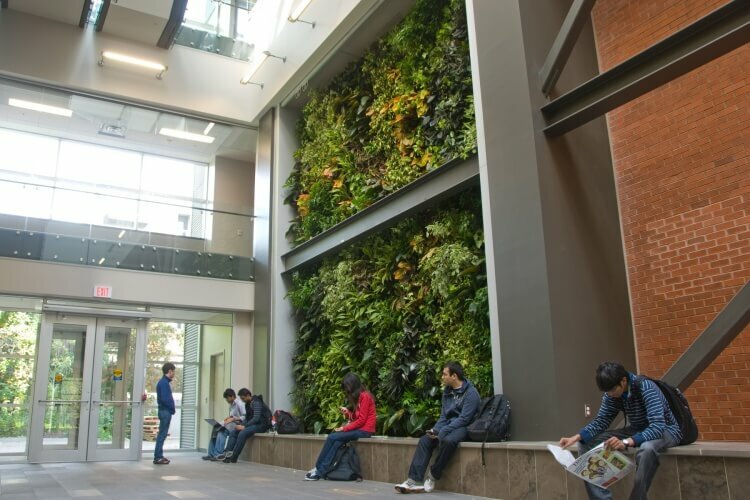 A two-story bio wall in the atrium connects to the HVAC system and acts as a "living air filter". 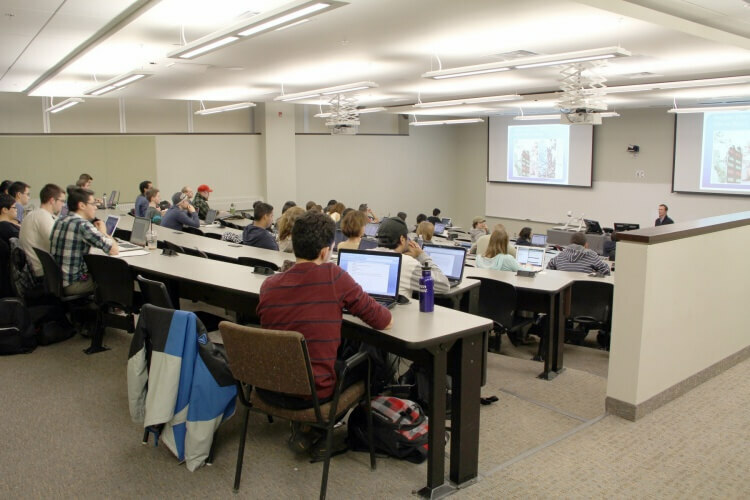 A 150-seat lecture hall on the main floor, equipped with low impact furnishings and videoconferencing capabilities, accommodates university-wide classes, and attracts high-level guest lectures. 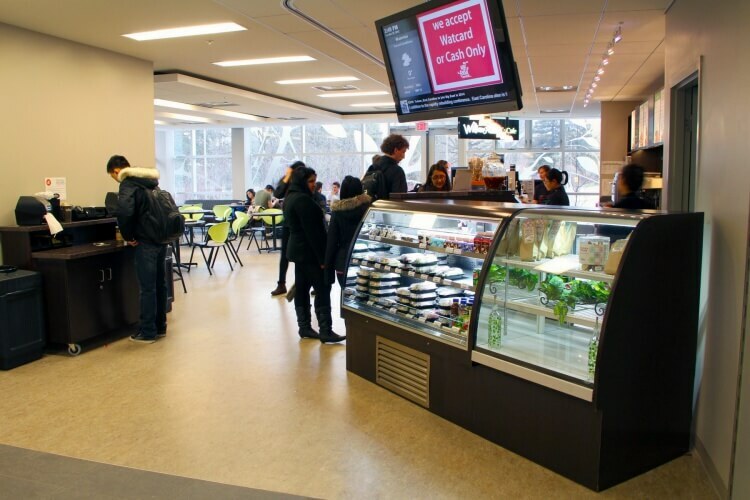 A bustling café provides a unique gathering place, offering fair-trade java and nutritious, locally grown alternatives to standard campus fare. A constructed wetland area treats wastewater by discharging it into a vertical flow system, allowing wetland plants to cleanse it. An adjacent cistern allows for rainwater collection. 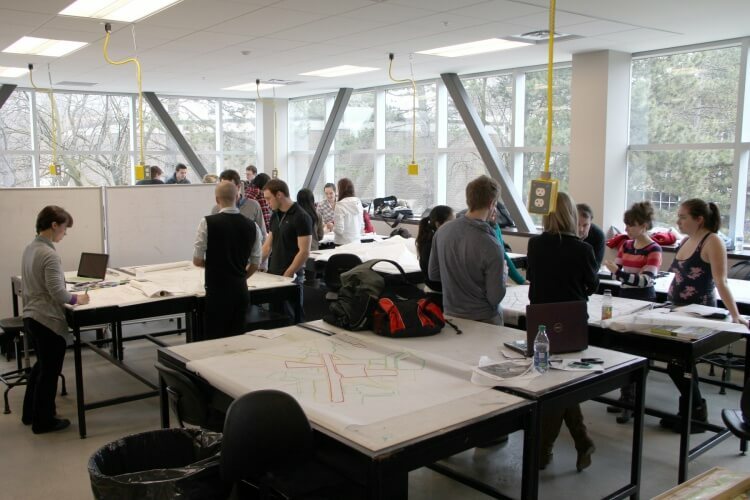 A bright, spacious Design Studio with an abundance of natural light and views, provides an ideal work space – and second home for many Planning students and others. 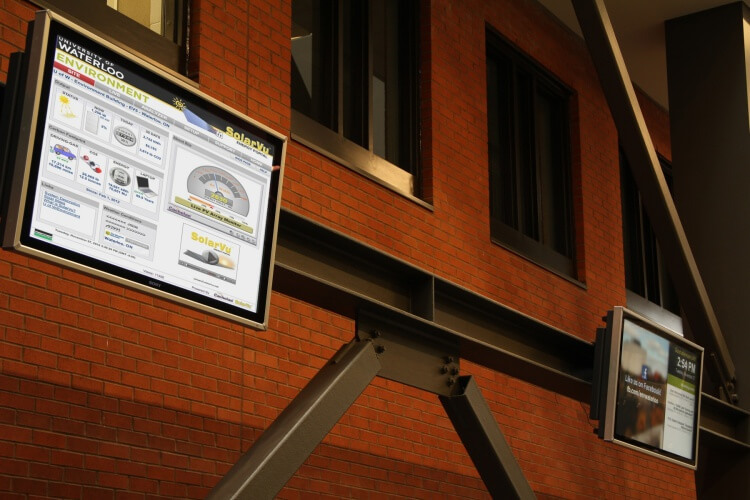 State-of-the-art metering systems, displayed on digital monitors in the atrium, will track ongoing energy and resource use in the building. A 5,000 sq. 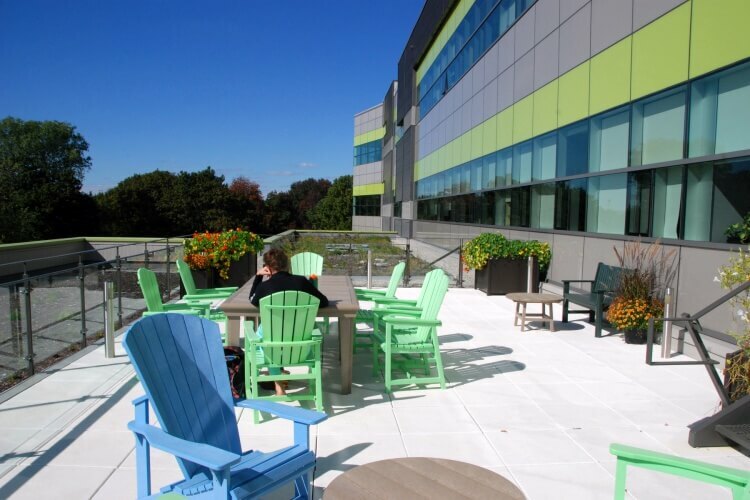 ft. green roof garden patio features native and experimental plantings accommodates up to 60 people. A solar power system spans a large section of the roof generating 67,000 KWh/year. Other sustainable measures include high efficiency lighting and plumbing fixtures, renewable materials, and low-emitting materials throughout the building. 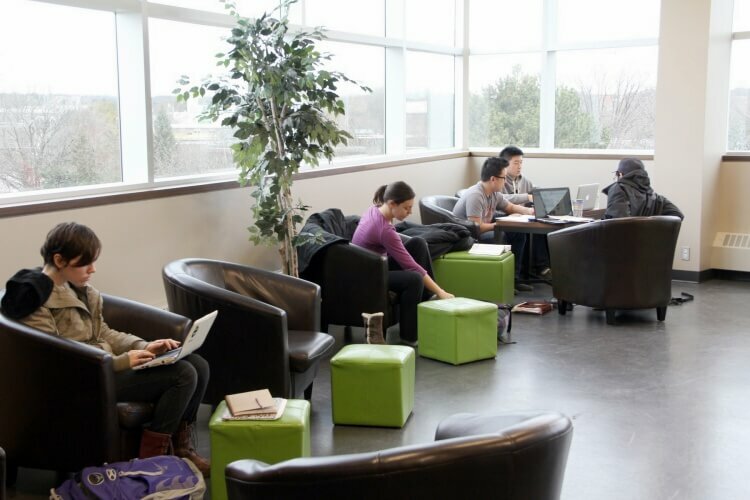 90% of the student and faculty spaces have access to views and/or natural light. The creative landscape design of gardens and stone paths in and around the building incorporates student ideas gathered through a faculty-wide competition and provides natural gathering spaces and exciting research. Here's a snapshot of the green features that make EV3 LEED Platinum certified.